This is a very quick and easy to follow guide about how to self-host and deploy your own Piwik instance using Docker with support for https. I recommend using CoreOS to run your Docker containers, but any OS that is capable of running Docker should work. Install Docker Compose (which is not installed by default on CoreOS). Download Piwik and get it ready. You do not need a powerful server. I am running Piwik on a 512mb VM on Vultr. You can also use any other OS running Docker, and the process should be similar. CoreOS (you knew that already). Docker (you also knew that already). MariaDB as the DB backend. Caddy as the web server. I connect as core user, which is the default non-root user for CoreOS. Check the version you are downloading, at the time of writing 1.17.0 was the latest one, but it will change. This will put the latest version of Piwik in /srv/pwk. I use pwk instead of piwik as the directory name so that I don't accidentally override or extract something on top of it. PHP runs as user 82 inside the Docker container, so we make user 82 the owner of the pwk files. Copy my piwik-docker repo, where I have a docker-compose file ready to be used. Duplicate and edit the .env files with the necessary environmental variables. The Caddy container needs two environmental variables to run, the domain from which you will serve Piwik, and an email to associate to the SSL certificate it will get for you from Let's Encrypt. The MariaDB container needs four environmental variables. Everything is now ready for Piwik to run. The following commands will build and start all the Docker containers and will make sure they are always running. Your instances will be automatically started after a reboot. You should now be able to access and install your own instance of Piwik via your domain (the one you set on /srv/Docker/caddy/.env). 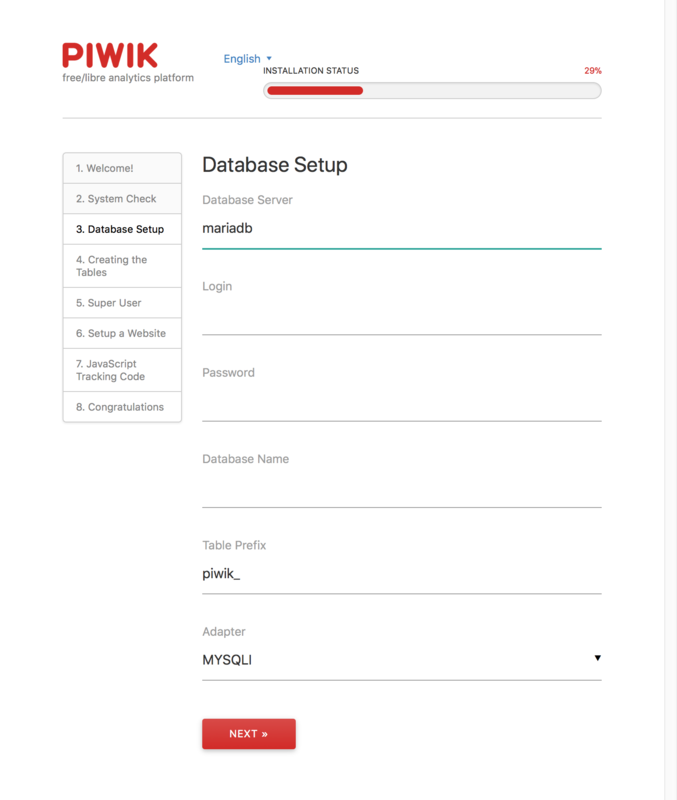 When installing Piwik you will be prompted for your database connection information, make sure you use mariadb as your "Database Server". /srv/caddy: Caddy configuration for SSL certificates. /srv/pwk: Piwik itself, with its configuration files. /srv/mariadb: MariaDB data and configuration files. The most important folder of all is /srv/mariadb/datadir, so keep regular backups of that (you've been warned!). The second most important folder is /srv/pwk, especially if you've installed plugins or made changes to the Piwik config files. Piwik installation is simple, and they have a reasonably good installation guide. I hope you enjoy using Piwik. If you have any problems with the deployment, let me know. Future self, I created this blog to help you remember the things you’ve learn in the past, so you don’t have to re-learn them in the future.